The snow is falling and a chill is in the air. The Christmas tree is shining in all of its glory, and the stockings are now hung by the chimney with care, just waiting to be filled by Santa. Carefully wrapped packages begin to appear under the tree and the Christmas spirit is evident in the air. In the midst of classic Christmas movies, holiday parties and checking your gift list twice, it’s easy to forget about one of the main holiday attractions – Christmas dinner. While the traditional Thanksgiving meal with turkey, stuffing and mashed potatoes was great, Christmas is time to enjoy everyone’s favorite culinary option: beef. 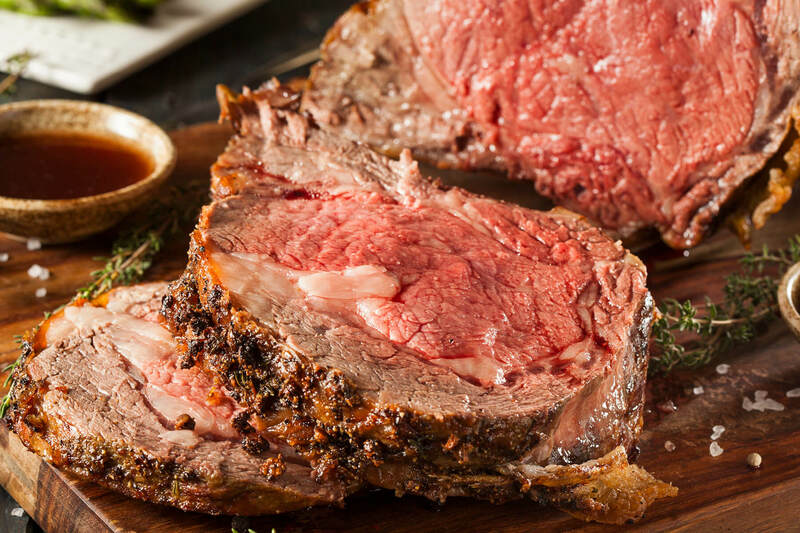 Whether you prefer yours to be roasted, grilled or pan-seared – we can all agree on one thing; it’s not Christmas without a prime rib roast! Oven roasting a prime rib is the easiest way to cook your Christmas dinner. Oven roasting is often considered a “simple” cooking method because it allows you to use a lower temperature over a long period of time. There’s nothing better than setting the timer and forgetting about the main meal while you’re busy preparing side dishes and desserts. Follow these five easy steps for preparing a delicious Certified Hereford Beef rib roast in no time. 1. Preheat and prep: Set your oven and season the roast per your recipe. You can find many different roast recipes at certifiedherefordbeef.com. 2. When in Doubt, Sear: While it’s possible to develop a rich, flavorful crust through slow roasting, you’re likely to get better (and tastier) results if you sear your meat over high heat in the beginning of the cooking process. To sear, heat oil over a large non-stick or cast iron skillet. Once sizzling hot, add the roast and sear for 2-3 minutes per side to create a crust on the meat. 3. Low and Slow: Place the beef fat-side up in a roasting pan. Insert an oven-proof meat thermometer (if you have one). Be sure to not cook past your target temperature because the roast will continue to cook after pulling it from the oven. 4. Let it Rest: After removing the roast from the oven, transfer the roast to a carving tray or cutting board and cover it loosely with aluminum foil. Let the roast rest 15-20 minutes. This allows juices to be absorbed into the meat, making for a very juicy and delicious cut of beef! 5. Carve and Enjoy: When it comes time to carve your roast, make sure you have a sharp knife! Always cut across the grain for maximum tenderness in your roast. Serve up and dig in! Don’t forget to visit our recipe library to select your perfect Christmas dinner recipe from our Holiday Favorites recipe collection. For more beef roasting tips, visit www.beefitswhatsfordinner.com.